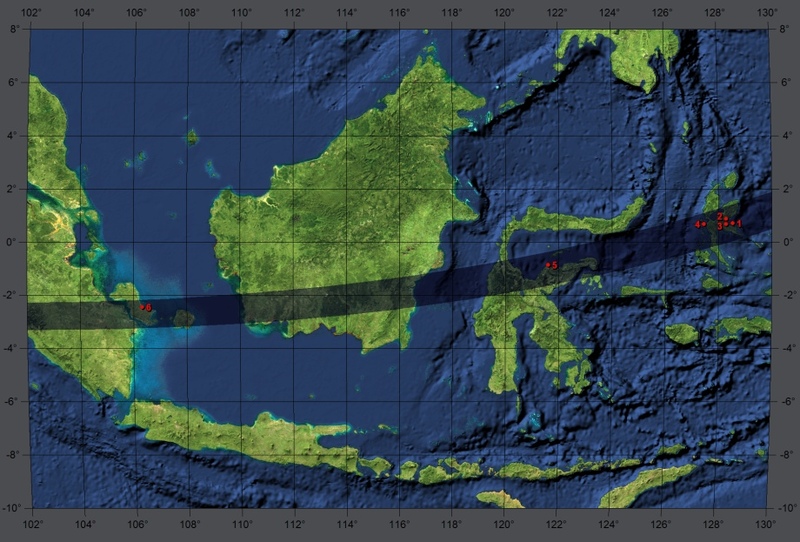 The Shadow-tracking expedition to Indonesia which was led by Shadia Habbal (Institute for Astronomy, University of Hawaii at Manoa) had three observing places (marked in the map 1, 2, 3) and three cooperating observing places more belonging to different expeditions (marked in the map 4, 5, 6). Unfortunately only observing place No. 6 had clear sky during the totality. Observing place No. 5 had some very thin clouds which influenced the images only at the end of totality. The last observing place with at least partially clear sky was observing place No. 4. All other observing places had clouds during the totality. Detailed information about the expedition can be fond here.